I finally made it to Eugene! Walking into the main airport area was pretty cool, since the entire place is decked out in Tracktown USA and USATF Olympic Trials regalia. I even sat next to a gentleman, on my short flight from Portland to Eugene, who'd traveled a great distance to watch his grandson, Trayvon Bromell (formerly of Baylor University), compete in the 100m event; can you imagine? Two of my Oiselle teammates, and roommates at the house we've dubbed Home Tweet Home, met me at the airport and I couldn't have been more excited to see them. Marilyn and Krysta shuttled me over to the house to drop off my things and it's such a great spot; Marilyn picked it out for us and she did a great job! After we got some things ready, it was time to head for the track! I realize that I enjoy the track a little more than some, but y'all...this place is incredible. Hayward Field, and its surrounding area, was just buzzing with excitement yesterday and watching these athletes run is absolutely indescribable. Kate Grace, a Oiselle athlete, killed her heat of the 800m semi-final; she powered from 5th to 1st right before our eyes. I'm so excited to watch her compete in the final. We were also able to watch Oiselle athletes Dominique Jackson and Lauren Wallace who also made quick work of their 800m races and were on fire! In the women's 400m event, University of Arkansas' Taylor Ellis-Watson smoked the competition in her heat and will go on to compete for a spot in Rio; I'm excited to see this one, too! Probably the most exciting race, to me, yesterday was the men's 10K because two of the front runners, Bernard Lagat and Hassan Mead, dropped out of the race, in addition to three other competitors; it was 81 degrees and those guys took a beating. Mead came back into the race, and finished, but the others did not. Galen Rupp stole the show, of course, and while I'm thrilled that he has once again provided a strong performance for the U.S., it's tough for me to watch him without having doubts about the source of his strength. Since I'd been awake for a really long time, we all decided to go find some food; after a delicious hamburger and a couple of beers, we had to keep moving on. 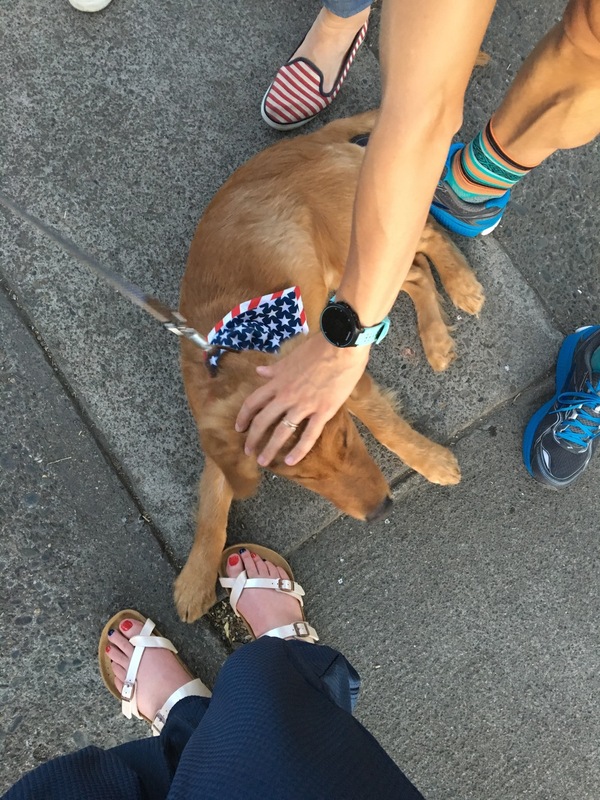 We also met a new, patriotic friend at the ice cream shop; what a cutie! Jun 30 It's finally here!